NCI offers Bevco’s cleanroom seating for controlled environment applications. Our Cleanroom Chairs provide ergonomic design & total body support for all-day comfort. All Cleanroom Chairs feature a large, comfortable waterfall seat and large backrest, easy-to-use pneumatic seat height adjustment, 360 degree swivel & fully adjustable back with lumbar support. 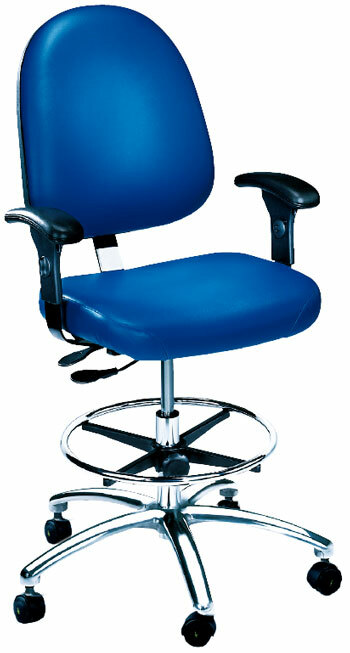 Bevco’s line of ergonomic clean room chairs are ideal for applications within the semi-conductor, aerospace, bioscience, pharmaceutical, computer, medical device, medical equipment and munitions industries. Each clean room chair is designed to meet the particulate goals of Federal Standard 209 / ISO 14644-1. Testing by an independent laboratory certifies Class 10, Class 100, Class 1,000 & Class 10,000 compliance.